Police and court records show that a 23-year-old Buhl man who apparently committed suicide last week at the Blaine County jail had substance abuse problems that likely started when he was a teenager. Idaho court records show that Mitchel Wayne Christensen had three misdemeanor underage alcohol-related convictions in Twin Falls County from 2009 through 2011. However, his drug problem apparently worsened when he moved to Blaine County in 2013. If police allegations are true, his substance abuse problems led to several pharmacy robberies in Idaho and Utah when he was out on bail from a felony grand theft charge in Blaine County. That crime, too, according to court records, was also linked to drug abuse. Christensen died Saturday, June 14, at Saint Alphonsus Regional Medical Center in Boise, where he was flown by air ambulance after falling 13 feet the day before from a second-story railing at the Blaine County jail and landing on his head on a concrete floor. While the death is still being investigated, evidence overwhelming suggests, according to the Blaine County Sheriff’s Office, that Christensen jumped intentionally. He’d been in jail for only two days, having been arrested on Wednesday, June 11, in Twin Falls County on a Blaine County arrest warrant charging him with failure to appear at a June 9 court hearing. The arrest warrant was the third issued by Judge Robert J. Elgee against Christensen for violating the conditions of his release on the grand theft charge. The other two were issued, according to court records, because Christensen failed several required drug tests, with analysis showing he was taking unprescribed prescription pain medication. Christensen was suspected of stealing prescription pain medication in pharmacy robberies in Twin Falls, Blackfoot and South Ogden, Utah. Information on Facebook shows that Christensen was a popular and well-liked young man in the Buhl area. Friends raised several thousand dollars this week through GoFundMe.com to help with his funeral expenses. Court records state that Christensen moved to Blaine County in July 2013. He was an express deliveryman and worked part-time at the Base Camp Fuel convenience store on Warm Springs Road in Ketchum. His trouble with the law started in Blaine County in January when he was charged with grand theft and providing false information to police for allegedly faking a robbery at Base Camp in December and stealing almost $2,000 himself. His arrest on Jan. 21 resulted from the police taping, unknown to Christensen, of a discussion, between Christensen and Base Camp owner Dustin Wendland. According to a probable-cause affidavit filed by Ketchum police Detective Tom Moreland, Christensen admitted to faking the robbery and stealing the money to buy drugs. The type of drug used is not specified in the affidavit but Moreland wrote that Christensen admitted to snorting and smoking a drug and later using drugs intravenously. 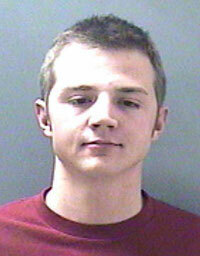 Christensen was released from jail after posting $10,000 bail on Jan. 22. A condition of his release required that he submit to random drug tests at the Blaine County Probation Office. A first arrest warrant was requested by the Blaine County Prosecuting Attorney’s Office after Christensen allegedly failed a drug test on Feb. 20, testing positive for pain medications hydrocodone and morphine. The motion filed by Deputy Prosecuting Attorney Matt Fredback states that Christensen had a prescription for hydrocodone but not for morphine. Christensen voluntarily appeared at a court hearing on Feb. 10, when he was arraigned on the Blaine County charges in 5th District Court. At the hearing, Judge Robert Elgee quashed the warrant but warned Christensen to abide in the future by the conditions of his release. Two other warrants, both granted this time by Elgee, were issued for Christensen’s arrest on March 26 and on April 10 for allegedly failing several other drug tests in March, testing positive each time for unprescribed pain medications oxycodone or hydromorphine. According to court records, Christensen was not arrested on those warrants until he appeared for another court appearance on May 7. Instead of sending him to jail, however, Elgee ordered that Christensen be furloughed to the Walker Center in Gooding for inpatient substance abuse treatment. Neither the Blaine County Sheriff’s Office nor the Blaine County Prosecuting Attorney’s Office could provide information as to when Christensen left the Walker Center, but the final warrant was issued for his arrest on June 9 when he failed to appear for a court hearing. He was arrested on June 11, and fell from a second-story platform at the jail two days later. Christensen is accused of committing numerous crimes while out on bail or furloughed to the Walker Center. While police suggest that he may have been involved in other robberies in Idaho, Utah and southern Oregon, he was specifically identified as a prime suspect for involvement in robberies at a Kmart pharmacy in Twin Falls on March 10, at a Walgreen’s drug store in South Ogden on April 30 and at a Walgreen’s drug store in Blackfoot on May 27. According to police reports, the Blackfoot robbery was committed at gunpoint. Funeral services for Mitchel Wayne Christensen are scheduled for 11 a.m. Saturday, June 21, at the First Christian Church in Buhl, under arrangements by Farmer Funeral Chapel.